Weekend Walk-In Interviews in Various Pharma Companies..
1. Walk-In Interview for M.Pharm / B.Pharm / M.Sc Freshers on 7th Nov, 2016 @ MEDREICH. 2. Steril-Gene Life Sciences (P) Ltd - Walk-In Interview for Freshers & Experienced Candidates on 05/11/2016 @ Pondicherry. 3. Walk-In for B.Pharm / M.Pharm / B.Sc / M.Sc / BE / MBA / B.Com / M.Com / ITI in All Departments on 5th & 6th Nov, 2016 @ Swiss Garnier Genexiaa Sciences. 4. MACLEODS - Walk-In Interview for Freshers & Experienced Candidates on 5th & 6th November, 2016 @ Nashik. 5. Glenmark Pharmaceuticals Ltd - Walk-In Interview for B.Pharmacy / M.Pharmacy Freshers on 9th November, 2016 @ GOA. 6. LUPIN LIMITED - Walk-In Interview for Freshers on 6th November 2016 @ GOA. 7. HETERO - Walk-In Interview for Freshers on 05/11/2016 (Saturday) @ Hyderabad. 8. Glenmark Pharmaceuticals Limited - Walk-In for M.Sc Freshers on 5th November, 2016 @ GOA. 9. BIOCLINICA - Walk-In Interview for Freshers as Drug Safety Associate on 5th & 6th November, 2016 @ Mysore. 10. Aizant Drug Research Solutions Pvt. Ltd - Walk-In for FRESHERS on 5th November, 2016 @ Hyderabad. 11. Cipla Ltd - Walk-In Interview for Multiple Departments on 5th & 6th November, 2016 @ Chandigarh. 12. MACLEODS - Walk-In Interviews on 4th & 5th November, 2016 @ GOA. 13. 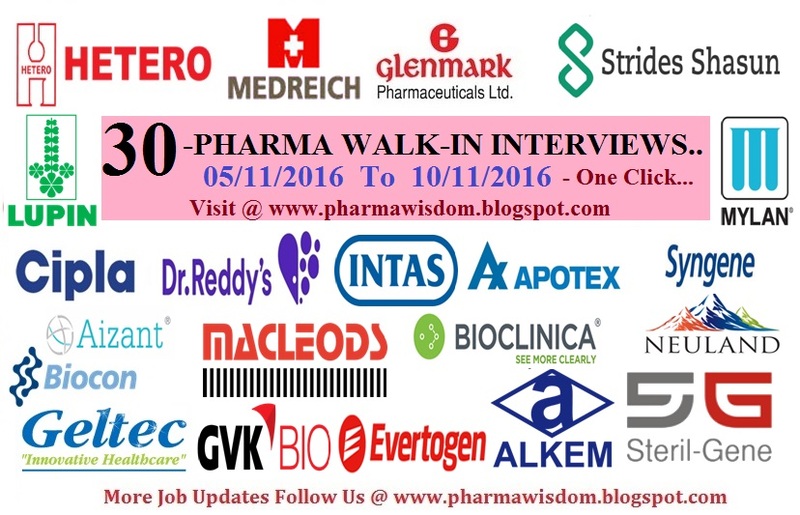 Ajanta Pharma Limited - Walk-In Interview for Multiple Openings on 6th Nov, 2016. 14. Cipla Ltd - Walk-In Interview for Indore & Goa Units on 5th & 6th November, 2016. 15. APOTEX - Mega Walk-In Drive for Multiple Positions on 5th & 6th November, 2016 @ Bangalore. 16. Dr.Reddy's - Walk-In Interview for Baddi & Vizag Units on 6th November, 2016 @ Baddi. 17. INTAS PHARMA - Walk-In Interview for Quality Control on 6th November, 2016 @ Ahmedabad. 18. GVK BIO - Walk-In Interview for Bangalore Unit on 6th November, 2016 @ Baddi. 19. MEDREICH - Walk-In Interviews for Analytical & Formulation Departments on 05/11/2016 @ Bangalore. 20. Strides Shasun - Walk-In Interview for Multiple Departments on 5th Nov, 2016 @ Bangalore. 21. Syngene - Walk-In Drive for Chemical Development on 5th November, 2016 @ Bangalore. 22. Geltec Pvt. Ltd - Walk-In Interview on 05/11/2016 @ Bangalore. 23. Dr.Reddy's - Walk-In Drive for B.Pharm / M.Pharm / M.Sc Candidates on 6th Nov, 2016 @ Visakhapatnam. 24. Neuland Laboratories Ltd - Walk-In Interviews for Production / QC / QA on 5th Nov, 2016 @ Hyderabad. 25. APOTEX - WALK-IN DRIVE for ALL DEPARTMENTS on 5th & 6th [Sat & Sun] November, 2016 @ Bangalore. 27. Alkem Laboratories Ltd - Walk-In Interview on 8th & 9th November, 2016 @ Daman. 28. Evertogen Life Sciences Limited - Walk-In Interview for Multiple Positions from 04/11/2016 to 08/11/2016 @ Jadcherla. 29. Biocon - Walk-In Interviews for Q.A & Production Departments on 10/11/2016 @ Hyderabad. 30. USV Private Limited - Walk-In Drive for Production / Q.C / Q.A Dept. on 8th & 9th Nov, 2016 @ Daman. Job Openings for Quality Assurance Department @ Mylan Laboratories Ltd. Urgent Openings for M.Pharm Freshers @ Pulse Pharmaceuticals Pvt. Ltd, Hyderabad.